MEDI+SIGN is honored to announce Dr. Anthony Stanowski as a new Advisory Board member to assist in the company’s healthcare communications and technology endeavors. MEDI+SIGN’s technology is a gateway to improving quality care by providing patients access to information on their caregivers and their treatment plans. MEDI+SIGN, a healthcare technology company that provides automated communication to the patient’s bedside, would like to officially welcome Anthony Stanowski, DHA, FACHE to the MEDI+SIGN Advisory Board. “We are eager to work side-by-side with Dr. Stanowski whose insight and expertise in healthcare will provide invaluable direction for the company,” says Andrew Hoffman, President of MEDI+SIGN. Dr. Stanowski is the President and CEO for the Commission on Accreditation of Healthcare Management Education (CAHME) which advances the quality of graduate healthcare management education through accreditation. He previously held executive and management positions at Fortune 200 companies, such as Aramark and Thomson Reuters Healthcare Division, academic and community based health systems, and small innovative entrepreneurial organizations. Dr. Stanowski is a frequent conference presenter, and co-authored the book, We Have a Match: My Journey through America’s Transplant System. 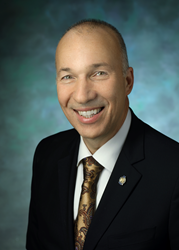 He has extensive experience serving on healthcare boards; he currently chairs the Board Quality Committee at Bon Secours Baltimore Health System. He served on the American Hospital Association Committee on Governance, as President of Healthcare Planning and Marketing Society of New Jersey and as the inaugural president of the Widener University Healthcare Management Alumni Association. Dr. Stanowski received his doctorate degree from the Medical University of South Carolina and holds graduate degrees from Drexel (Marketing) and Widener (Health Care Administration) as well as a bachelor’s degree from the University of Pennsylvania (Communications and Psychology). He is Board Certified in healthcare management as a Fellow in the American College of Healthcare Executives. For more information, contact MEDI+SIGN at our website: http://www.medisigndisplays.com, or by phone (301-790-0103). MEDI+SIGN provides hospital and healthcare organizations with a connected health platform that includes patient monitoring and digital whiteboard display solutions. MEDI+SIGN is an integrator of electronic health records and remote monitoring systems to collect and communicate updated and accurate patient health and status information to care teams and patients. MEDI+SIGN was established to leverage its proprietary visual communication technology to improve hospital and healthcare provider’s performance in patient safety and satisfaction, as well as the overall quality and delivery of healthcare. For more information, please contact us at http://www.medisigndisplays.com. MEDI+SIGN is a registered trademark.